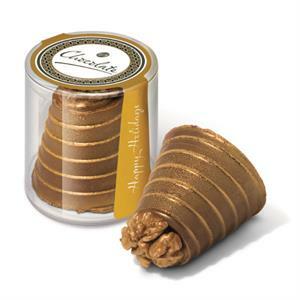 Take a look at our new Winter Collection of confectionery and chocolate gifts. Our new Mini Gift Box is perfectly sized for a giveaway, contents include two chocolate Medallions, an Organza Bag filled with chocolate foiled balls and our exciting new Christmas Bauble Tin with three sumptuous caramel pralines inside. 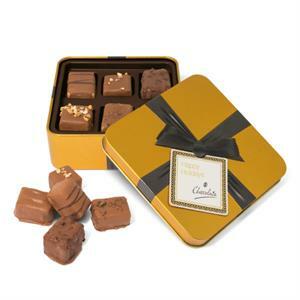 A rich and indulgent range of artisan chocolates presented in a high-end gold tin embossed with a black bow. Our new Midi Gift Box is our most popular sized gift box, packed with a range of our most exciting chocolate products. Choose from moreish chocolate covered honeycomb pieces hand dusted in gold and bronze or the popular gold and silver foiled milk chocolate balls.